Yeah...that's right. This is my 100th post. It's not really a big deal. I mean, in the blogosphere 100 is nothing, but I'm absolutely celebrating. When I started this blogging thing I gave myself a couple of weeks. I'm not a quitter, but I can easily get distracted (if you could only see my basket of half completed scarves). But here I am, 100 posts later and still excited about sharing my thoughts, ideas, perspectives, and well, what not. So I'm throwing myself a little party (hold please as I dance around the room in excitement!). I'm definitely looking forward to sharing more with you, expanding my topics, and enjoying the ride. 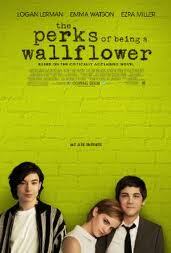 Stephen Chbosky's book Perks of Being A Wallflower did not make my top anything list. I can't really explain my distaste. Maybe it's because it was so pumped up in reviews and long monologues about how it is a life-changing book. Maybe it's because I didn't immediately like Charlie, or Sam, or Patrick. Maybe because it differed so greatly from my own high school experience. I don't know. I just didn't jump on the Perks bandwagon. But...I just saw the movie and I absolutely loved it. Logan Lerman was perfect parts awkward and endearing (congrats Logan on acutally acting for once! ), Emma Watson was believably rebellious and troubled (once I let go of Miss Granger), and Ezra Miller was just brilliant. Really. Brilliant. The music was great, the setting was great, the story was painful and great. So, yeah. Mr. Chbosky, you made me a fan.